To the untrained eye, yoga seems to be about growing supple enough to tickle your head with your toes or wrap your legs into the shape of a pretzel. But the practice isn't really about flexibility. Yoga is about balance. It’s about walking that fine line between too much and too little, between too tight and too loose. Stray off the deep end of suppleness and you’ll end up as weak as a rag doll. Err on the side of steeliness and you’ll end up as impenetrable as a bull. Follow the middle path, though, and you’ll nurture a well-balanced blend of softness and substance that feels vital, resilient, spacious and full. Salabhasana, or locust pose, falls into the category of strengthening postures that serve as useful foils for some of yoga’s more noodly contortions. This reliable workhorse cultivates strong hip and back muscles, a revitalizing fire in the belly, and a pleasant sense of extension into the big, bright world beyond. It prepares the spine for deeper backbends and offers a wealth of variations to keep us challenged and curious along the way. And it gives us an opportunity to practice the fine art of growing strong without growing tough. My young niece says this pose looks less like a locust and more like a Viking ship. (She’s on to something here, since some yoga traditions do call this shape navasana, or boat pose.) 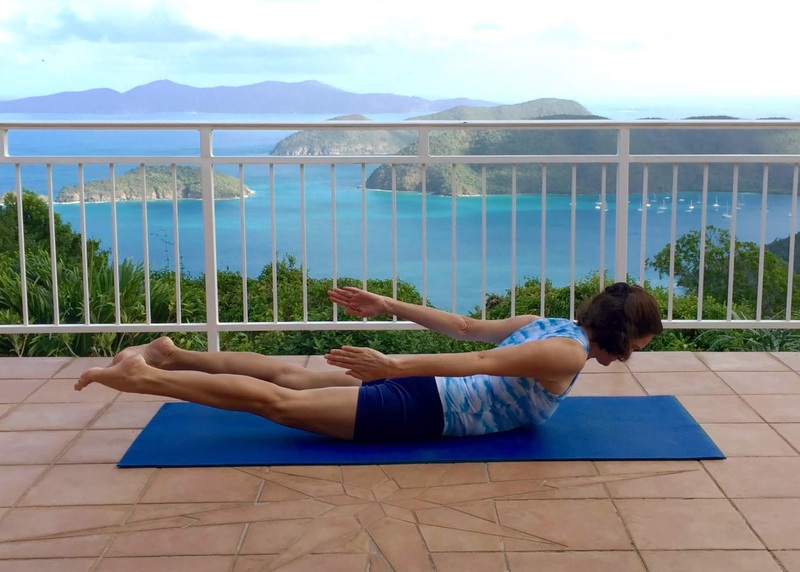 For me, locust pose feels like flying. I feel as if I’m an Acapulco cliff diver, leaping upward and outward in a satisfying swan dive that reaches to the sky’s horizon. Here, we’re given the chance to defy not only gravity but also those sticky fears that conspire to keep us small. For a few sweet moments, at least, we’re called upon to be big and bold and bright and expansive. There’s no hiding in the swan dive of salabhasana! Before diving off the cliffs of this asana, let’s begin by letting go. Settle onto your belly, with your legs outstretched and your head resting comfortably on the floor. Let your back body be broad and unfettered as it surrenders to the pull of gravity's embrace. Layer by layer, from the outside to the core, let everything about you unravel. Exhale completely and greet the earth beneath you with a sweet sigh of relief. The softer your body grows, the more fully you'll feel the tide-like ebb and flow of breath as it pours into and presses out beyond you. Can you feel your back waistband rising with the inhalation and falling as you breathe out? Can you feel your hips and shoulders gently rocking, too? Let the breath be deep and calm, and invite every cell of your body to settle into its rhythmic cadence. Let's start by exploring locust pose limb by limb, taking care to maintain a spacious quality while initiating the movement from the core. Draw your mind's eye to your belly and trace an inner line from there through your right hip, knee and heel. Invite a gentle surge of energy to sweep along that path - just like electricity running along power lines - to slide that leg away from the center of your body. Invite the leg to feel easy and elastic as it telescopes away from your core. Hold that extension a few breaths and then release your leg to neutral. Try this a few more times on this side, eventually letting the thigh take flight off the ground once you reach your maximum extension. Remind the leg to stay long and the back knee to stay full and vibrant. Relax the leg to the ground, settle in for a rest, and return to the steady pulse of the breath. Compare the two legs. Does your right leg feel just a little brighter and livelier, perhaps? Maybe even a little longer than the other? Repeat this action on the second side. Remember, this pose is more about extension than height, so resist the temptation to bend the legs or distort the hips just to create the illusion of lift. Keep the fronts of the thigh, knee and foot looking down at the floor. And keep the pelvis squarely on the ground so that a small cat napping on your hips wouldn’t fall off to either side. Once you’ve played around with this action with each leg, turn up the heat a bit by lifting both legs at the same time, while still keeping the upper body soft and unfettered. Trace little tentacles of energy from the belly through the toes and beyond, slipping those long legs out, up and away. Let the legs hover a comfortable hip-distance apart. And remember, keep the legs bright and endless. To avoid jamming the lower back, reach your tail toward your heels rather than up to the sky. At the same time, keep the tops of the back thighs floating upward. When you feel the weight of your front torso settling down toward the pubic bones, you'll know you’re extending well through the lower back. Here’s an opportunity to tuck a little nap into your practice while your body absorbs the goodness of the movements just practiced. Rest down onto the floor and note the changes half locust has engendered. Likely you'll feel a happy hum in your hips and hamstrings. You might also feel heat building in the midsection of your body. Settle into the support of the ground and the nourishing quality of the breath. Wiggle your hips from side to side to ease out the lower back. When you feel calm and rested, you're ready to explore the top half of salabhasana. Here, the legs stay grounded while the arms swim about in space. Remember, we want to move from the core rather than the extremities so that the deepest spine can be washed in the exhilaration of the pose. This means lifting the spine first and letting the arms follow along like kite tails behind, instead of picking the hands up and asking them to drag the rest of the body along. Send a surge of energy from your belly up through your spine to lift the chest, shoulders and head off the ground, keeping the chin gently tucked and the back of the neck long. Send another wave of movement from your heart through the arms to draw the hands up off the ground and back toward your feet. Slip the shoulder blades down the back and let the heart swoop forward and up. Hang out here for a moment, breathing steadily and noticing how your chest bobs up with the inhalation and falls a little with the exhalation. Don’t freeze out these waves - ride them joyfully. After another easy descent (another nap! 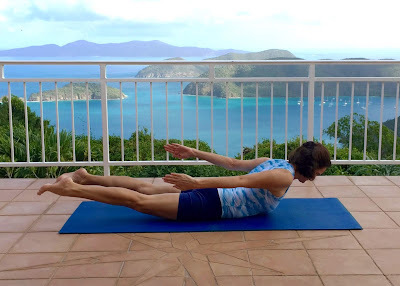 ), you may like to combine the bottom and the top halves of the pose, leaving just the lower belly on the floor while the rest of you soars in space. First, soften completely, key into your breath and resist the urge to grow tough in anticipation of the challenge ahead. Let the breath soothe and stretch you, and invite its spaciousness to stick around for the next few moments while you sprinkle a little exertion into the mix. Draw your awareness to your deep belly and bloom outward from there. Slide the thighs back and up, and slide the heart forward and up. Let the rest of the body follow along, lengthening from the center out through your farthest reaches. Fill all the crevices of your back body - top thighs, knees, heels, kidneys, shoulders, wrists and fingers - with buoyant, sky-bound helium. Bloom and breathe. Let the body undulate just a bit as you draft on the cool currents of the breath. Keep your brain and eyes soft and friendly. Reach out bravely in all directions. Be full in your heart. Be light. When you feel your soft and spacious swan dive giving way to fatigue, waft back down to earth. Rest quietly, sinking back into the breath’s refreshing rhythms. Rock your hips and shoulders so the wrinkles of the back body can slip away. Do you feel a warm and happy buzz percolating through you? Do you feel bigger, perhaps, than just a few moments ago? Now comes the best part. The hard work is over and you’re left basking in the afterglow of the pose. Even though you’re back on solid ground, soft and supple and settling in, a part of you still soars. You’re resting happily at home while soft and shiny bits of you sail off into the far corners of the world.